We can probably all agree that eyes would just be useless bags of vitreous humor if not for their wiring to the brain. 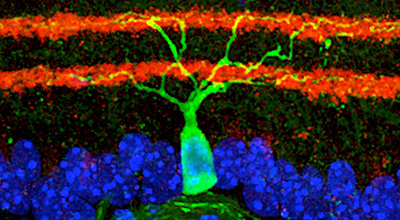 It’s the highly precise connections between specialized cell types within the eye and their specific target cells within the brain that allow us to visually experience our world. But how do these axons know where to go during development? How does this intricate architecture contribute to our ability to see and interact with our environment? And how can we reestablish this wiring once it’s damaged by injury or disease? Dr. Andrew Huberman at the University of California, San Diego is hard at work answering these questions. During graduate school at UC Davis, Dr. Huberman worked on the problem of how initially intermingled left and right eye projections to the lateral geniculate nucleus get segregated during development. This eye-specific segregation is thought to depend on correlated neural activity patterns. Using immunotoxic depletion of starburst amacrine cells in order to disrupt correlated firing of neighboring ganglion cells, Dr. Huberman was able to show that left and right eye inputs segregate normally even without this type of correlated firing. However, when he blocked all spontaneous activity, the projections from the two eyes failed to segregate. As a postdoctoral fellow with Dr. Ben Barres at Stanford University, Dr. Huberman became captivated by the problem of how functionally distinct subtypes of retinal ganglion cells (RGCs) could be differentially labeled and manipulated. He began hunting for genetic markers that would allow him to visualize specific subtypes of RGCs. During a screen to identify mice that selectively express GFP in particular RGC subtypes, he succeeded in identifying a line that expresses GFP only in On-Off direction-selective retinal ganglion cells that detect posterior motion. Since starting his own laboratory at UCSD, Dr. Huberman has continued to make important contributions to our understanding of the development and organization of the visual system. Along with a graduate student in his laboratory, Jessica Osterhout, Dr. Huberman has recently contributed to our understanding of how neurons identify their precise synaptic targets. 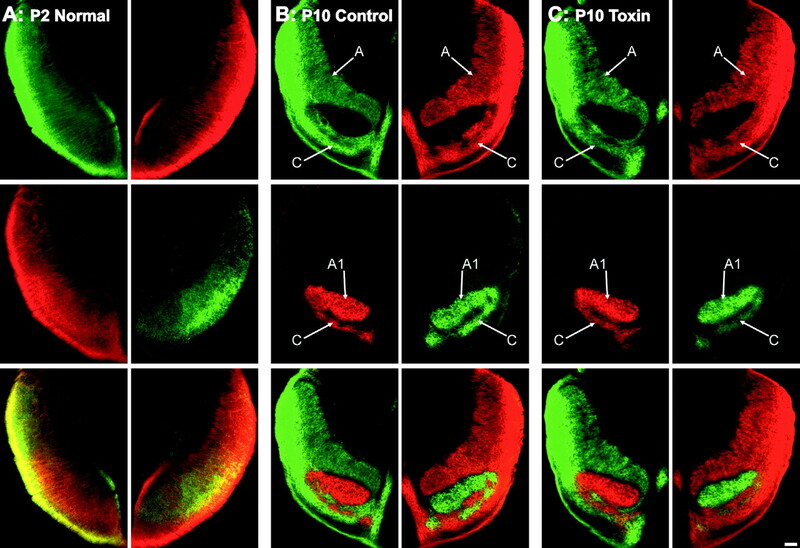 They have shown that the cell adhesion molecule, cadherin-6, is expressed in a subset of RGCs as well as in their postsynaptic targets in the brain. In order to establish that this cell adhesion molecule is necessary for these highly precise connections to form, they demonstrated that in a cadherin-6 knockout mouse, these RGCs fail to reach their proper targets and instead innervate other visual nuclei in the brain. 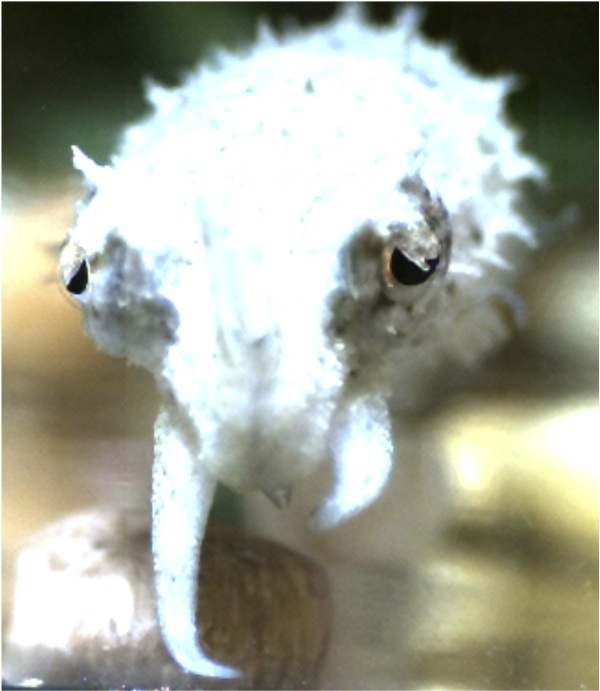 The Huberman laboratory is also interested in how the visual systems of different species is customized for specialized behaviors or environmental niches. Along with postdoctoral fellow Dr. Olivia Mullins, Dr. Huberman is using electrophysiology along with high-speed video monitoring in order to study the prey capture behavior of the cuttlefish. Fun fact: Dr. Huberman is also the treasurer and secretary of a non-profit organization, called Board Rescue, that supplies skateboards and safety equipment to low income children. Come join us on Tuesday, May 14th in the CNCB large conference room to hear more from Dr. Andrew Huberman about his work to understand the development, architecture, and function of the visual system. Andrea Hartzell is a first-year graduate student in the UCSD Neuroscience Program. She works in the laboratory of Dr. Brenda Bloodgood.